Hesitant to use social media professionally? 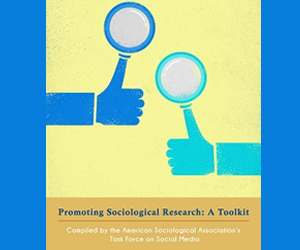 Download our social media tool kit to read about engaged public sociologists, best practices and practical advice for using social media, and dealing with public attacks. This document is published under Creative Commons license (by attribution, non-commercial, no derivatives). Creative Commons License allows others to use and share these information, as long as it is done with attribution credit, without changes, and not for profit. An introduction to social media tools and the art of digital media storytelling.